Our grown-up daughter just added Emily to her American Girl doll collection (Molly and Emily will be retired this year). Since Halloween is coming soon, she asked if I could sew a Halloween costume for Emily, as she would like to display Emily as one of her Halloween decorations on her desk at work. I looked though my fabric stash and found a tiny remnant that I pieced together for the skirt. 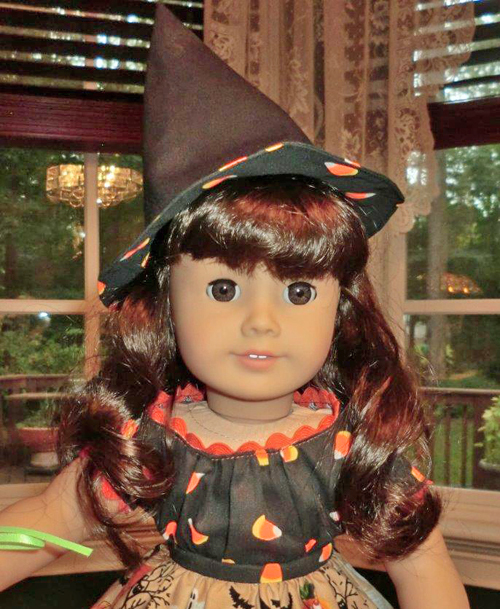 I was lucky to have some coordinating fabric with corn candy on it for the blouse and the hat. 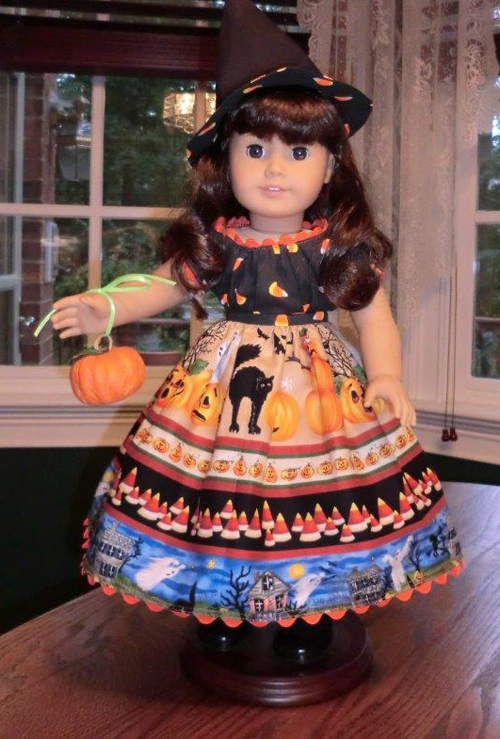 I used my original American Girl “Josefina” sewing patterns (no longer available) for the skirt and the camisa. YouCanMakeThis.com had a free pattern for the witch’s hat. This was the first time I ever used the SnapSource snaps and setter. I really like using these snaps instead of Velcro®. This was such a fun project and my BERNINA 830 sewed like a dream. I love the dual feed option!! It’s also a plus when I can use what I already have to create something lovely!! Update: Karen made a mask, too! 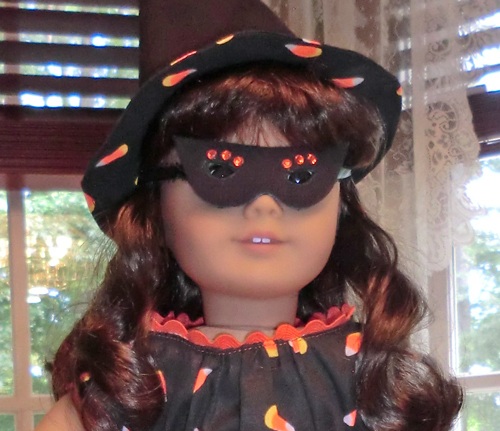 I was looking for a mask for the AG Halloween outfit and I found a link on the American Girl site. When you solve the puzzle, you get a link to print a mask to cut out. So, I did it and printed the mask—but it’s a little girl’s size, not a doll size. So, I reduced it by 50% on our scanner and it’s perfect. 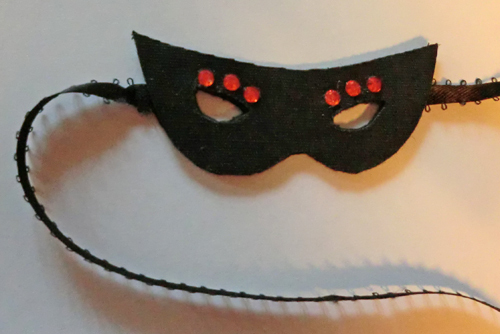 I just bought some Phoomph double-sided bonding fabric—not knowing what to use it for—and I thought it would be perfect for a mask. I thought about using a clear stick that holds a card for a floral bouquet to hold the mask, but I ended up using ribbon ties. Then I added hot fix crystals to give it some bling!